The most notable feature about Joyce Cheng (鄭欣宜) that catches the audience’s attention is her weight loss achievement. In total, she lost 93 pounds, dropping from 230 pounds to 137 pounds. Her successful weight loss slimmed down her entire body, even resulting in a much slimmer face. In the past, Joyce had possessed an illness. “At the time, I wasn’t fat, I was obese. It’s an illness. When I was younger, eating was a reward. As I grew older, it became a different matter. Last year, eating served as a way of self discipline instead.” Joyce said. Joyce admitted that she has a rebel personality, but it is her competitive nature that allowed her to overcome all the challenges in her life. It is this side which allowed her to remain strong and keep positive. talentless… faint memory of her mother… NEPOTISM at its finest in HK! In the past I would agree with you, but I heard her sing live and she’s actually decent. She screams too much, but she’s better than a lot of female HK singers. I agree that if it wasn’t for her mother’s name, she would be a nobody (especially with her looks and weight) or at least wouldn’t be giving so many opportunities, but I wouldn’t say that she’s completely talentless. I agree, she’s definitely better then 90 percent of current Hong Kong singers. Unfortunately she’s in an industry when looks and weight triumphs over any amount of talent. Talentless?? Surely you mean Raymond Lam, or Twins, or Ekin Cheng, or so many other singers and actors in Hong kong who got popular NOT because of talent but because of god-knows-what. Hong Kong people are just too obsessed with weight, that’s all. If you look at the before/after pictures of Kenix Kwok for instance, she wasn’t as skinny when she first started as she is now. Blame it on HK people’s abnormal standards for beauty. 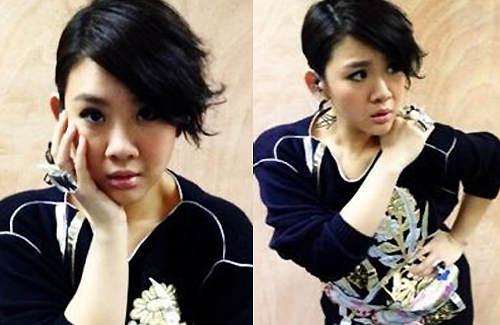 There’s nothing wrong with the way Joyce Cheng looks…aka, like a normal healthy person. Unless you are a singing coach or vocalist yourself, please refrain from bringing other down people and calling them talentless just so you can prove Joyce Cheng is talented. You could have approached it in a more professional way i.e. start posting up youtube videos, if you must, of Joyce singing quirks and prove those who outright said she is talent-less wrong. I am sick and tired of people bringing down others just to make their point. A real talented singer does not need comparisons. Talent stands alone. Disagree! She has a good singing voice. Talk about rude! She’s not untalented. A good singing teacher can help a person improve their singing but it’s obvious that she has a good singing voice in the first place. I agree. She does have a good voice. There are too many people in this world who thinks singing is a born talent, that is not true. I am sure that many of the singing legends, coupled with their excellent born rich voices, went through intensive vocal training to be where they are now. One can be born with a beautiful voice but if not trained properly, well, it can only fool the ears for so long. Joey Yung is downright unattractive. Looks like her body will shatter if she trips. The HK audience is being too critical of Joyce because of Lydia. I admire Joyce for being such a hard-working, grounded person despite all the negativity. Support you Joyce! Let’s not forget Adam Cheng is her father as well. You mean the man who left her mother, didn’t even really want to be publicly known as her father, and told her she had to lose weight (and my guess is that it was not out of fatherly love, but more out of judgement)? Don’t worry, no one is going to forget that. In defense of Adam Cheng, that was EONS ago and Lydia Shum had before her death and a long time before that forgiven him and that was why he could return to TVB. Joyce herself accepted her half sister. And she was obese and he said it out of concern. He is proud of her and they have a good relationship, something Lydia was very proud of her daughter when she herself could not achieve that because she was filled with anger. It was the daughter who united them. And if Lydia didn’t hate Adam, and Joyce calls him father, who are we to judge Adam Cheng who got a public shaming at Lydia’s very public memorial and unjustly so. Joyce was a class act during that time. beside his marital mistakes,you can say adam cheng is a good guy.i respect him as a talented actor/singer.i saw his old series and his look as “dai hap” in wuxia series were unequalled. Wish I can be like Joyce and forgive things of the past. Lydia might not hate Adam, but she sure does hate the woman who was the third party (官晶華). It’s her connections and preserverance that her there. I like what she said so far, some people are really mean. She lost weight for her health. I think she has a good personality and is confidant of herself. Hk girls are stick thin, if you’re not a stick, you are borderline ugly. Ex. When someone says this girl is fat when she’s 130 pounds or is on the flabby side. which shouts: Is anorexic pretty? I use to think of her as attention seeker but she has grown more mature after her mother’s passing. Although I’m not a fan, I like her character and is comfortable in her own skin. Reminds me when my annoying aunt kept saying I look fatter when I weighed 120 pounds, just cuz I’m not stick thin, bothered me for awhile but shrugged it off that she’s just rude. Lol! Ever since her mother passed on she has grown to be a fine young adult. I like how she is real with her responses and shown to be a good role model for the younger generation. The entertainment business needs more role models with substance instead of relying on superficial features. I agree! I think she’s pretty and fine the way she is.. The most important thing is that she needs to be healthy! sammi cheng, kenix kwok, cecilia chung, yang mi, teresa teng, nanako matsushima were not born beautiful, they had plastic surgery, if joyce cheng want to look beautiful, maybe she can go for it too? Kenix Kwok actually looked more human before surgery. Cecilia Cheung actually is natural looking as far as I know. Joyce is not drop dead gorgeous but she isn’t ugly. uhhh….cecilia chung has always been beautiful, from king of comedy to present day, i don’t think she change that much. yang mi actually already look pretty before plastic surgery, wonder what the point of her having plastic surgery cuz now she look scary like heck to me, her face become so motionless now. Cecilia cheung is natural, but she did get breast implants I think. Her face is natural though and she has British blood so has more unique features. i think she is sincere and not fake like the other female artists. some people just can’t be stick thin because it isn’t in their genes. her mum was big size so for Joyce to be super slim like joey yung or sammi cheng, it will be tough. as long as she is healthy, is ok to have an extra few pounds. at least she isn’t as fat as the woman who starred in the drama with wong cho lam. i forgot her name….that one was obese!! I feel sorry for her (and all asian female celebs really) that she is that pressured to continually lose weight. Male celebs never get this amount of stick for a bit of flab on the side. In HK if your weight is not double digit, you’re considered fat. That is how insane things are. I think she is average size, there was a time she was too slim. But she is hardly overweight. If you’re using BMI to get a rough idea of how much one should weigh, you should be using the “Asian BMI” scale since Asians have a smaller body structure and different diets than Western countries. Which if that’s the case, 137lbs is heavy for a girl. Hell, it’s heavy for a Caucasian girl as well. You don’t use Asian BMI but you use universal BMI based on height. 137 is ok if she is healthy. And if she is not 5 feet tall. Some asian girls have a medium to large frame as well… Joyce is not a short girl so 137 is not heavy at all. Anyways, BMI is not a good tool for anyone to use… measuring body fat percentage is the way to go. Muscle weighs more than fat. Sorry all, BMI is just one of the indicators. You will need to consider body fat, body water content as well. Hope she is not too preoccupied with her weight as she looks to be thick bone mass which will be heavier than thin bone mass. Also, if she works out regularly, her % muscle mass will be higher thus keeping her weight high. I know a woman whose is 5″6″ who weighs about 150 but is definitely well proportioned and carries the weight attractively but she does not dress out to be the slim model type but the elegant type. the algorithm used to determine BMI uses several factors such as environment, socio-economics, diet (availability of certain foods) and the mean body mass of the population. Also taken into account is the prevalence of certain conditions like diabetes and anemia(s). More simply: Asians have different diets than say Europeans which have a diary-rich diet. They also have more meats available which overtime allows their population to have a higher height and body mass. Compared to that, many East-Asians are lactose intolerant and so throughout the ages we have grown to have smaller skeletal structure and body shapes. This means a 5’9 Chinese man weighing 150lbs is not necessarily equal to a 5’9 150lbs man born in the Swiss Alps. The discrepancy is very tiny of course, but then you have to take into account the average weight of the population and the weight cut-off of obesity (this is a sort of weight-zone where heart diseases and stuff like diabetes comes into play). The whole “women must look like a stick” thing is an Asian illness. it’s a shame really, because women destroy themselves internally because they aren’t skeletal. There is hope, I think… after all, they no longer bind feet in Asia, so maybe one day normal body types will be accepted as well. It is not just Asia. Barbie, anyone? Barbie did not come from Asia. I don’t see women in NA trying to starve themselves to look like Barbie. You don’t see it or you don’t outright try and learn of it does not mean it doesn’t exist. If it didnt exist, you would see most Hollywood stars big and overweight. Is that the case? @TVBFanantic Do you know every single women in NA? You can’t base your opinion on the small scale of people you know or see. Based on actual facts, anorexia is a huge problem amongst teenager girls in NA. If you pick up any magazine published in the NA you will mostly see stick thin models or actresses, rarely do you see a model in a size 8 or higher. Yes, I’m not blind to the fact that the problem exists everywhere. But what I do see if that the way people treat weight is very different between Asia/NA. The problem is more prominent in Asia. You can try to ignore the fact all you want, it doesn’t make it go away. Just take a look at what people say about Asian television stars or during the pageants. People were saying the ladies from the last miss HK were fat. It was crazy. The obsession to be skeletal is more widespread and more accepted in the Asian culture IMHO – and this comes from my experience while living there, and from discussing the issue with my wife (who is from HK) and my inlaws. And yes, this is a “sore” topic with me. I saw what the pressure to be “ultra thin” did to my students and co-workers when I lived in asia. It infuriated me, and the whole stick-figure culture infuriates me today. Here is a recent example… Heo Ga Yoon from 4Minute lost a lot of weight..
She used to have a very good body, great legs with a nice shape. But she went on a diet and now is so skeletal you can barely recognize her. I was shocked when I saw her stick-figure legs in her new video “24/7”. Take a look at the comments though… people wishing they could live in her body for just a day. I understand your frustration. I too follow these Korean idols, not very closely, but enough to know what netizens more specifically the Asian population has to say about their weight. Another example would be idol-group After School. There was a Korean American ex member, Rebecca Kim (Bekah), who had a beautiful body with curves but Koreans belittle her cause she was not the typical stick figure Korean barbie doll. Uee too lost tremendous weight and people are praising her. Yes, I know all about this and how the Asian sees this whole women needs to be thin. However the idea of being thin or wanting to be thin is definintely universal especially for celebrities. Face it, whether you are in Asia or not, people are use to seeing ‘thin’ when you’re in the spotlight. As for the every day life people, I assure you there are people living in NA who are obsessed in trying to look like a Barbie. As WildBerries stated, teenagers are facing anorexia and bulimia because they want to be thin. It is not an Asian illness. It is a media illness. The media is what emphasized ‘thinness’. If those who are interested in fixing this kind of thin epidemic, you begin from where it all began, the media. There are pressures to be thin in hollywood too, but there are plenty more actresses in comparison who are more average weight and not given so much stick for it. Didnt they also ban size 0 models on the catwalk? Hk actresses who grew up in the west like joyce cheng, kate sui and bernice lui have all been ostrcised for being “fat” when in fact they were at perfectly healthy weights before. Well, joyce fluctuated, but I hate the fact that you cant even having an ounce of fat in the industry. Eason has also recently said he dosent give a toss if he’s fat as they are criticising him now. Good on him. Why ppl be hating on her? She’s doesn’t have her parents anymore and she still standing strong. She a lot of talent. She start singing with her mom when she was a little girl.. Very touching moment when all the artists said their goodbye to Lydia. Joyce did a good job handling it. She did good when she played Wayne Lai lil sister. I’m guessing that she is definitely an heiress so ordinary HK people are wondering why she should benefit from pity since they coexist with ordinary people with far worse life circumstances. The income from being an entertainer in HK far outshines ordinary salaries so I think that’s why the second generations are all jumping in. But being second generation, they understand far less what it is like to be regular and in dire straits so they don’t realize that such confidences are not to be shared with reporters.